On successful completion of your BSc (Hons) Adult Nursing, Harrogate Trust will contract to guarantee you a job for at least two years with staff development opportunities. Applicants to the Harrogate Placement Pathway will be required to accept this mutually beneficial contract in order to qualify for this pathway. We regularly review our courses to ensure we are offering you the best educational experience. This course is currently being reviewed for September 2020 entry, therefore the information below is correct for students who joined us in 2019/20 but there will be changes for students who wish to join us in September 2020. Immerse yourself in a physically, intellectually and emotionally challenging course that will prepare you for a rewarding career. Spending 50 per cent of your time on practice placements, you will develop the practical skills needed to care for adults with acute and long-term illnesses across a variety of settings. You will come to understand your obligations in terms of your professional behaviour and conduct, and develop the expertise and confidence needed to become a registered nurse responsible for leading and coordinating care. Learning alongside students studying related healthcare professions such as physiotherapy, social work and dietetics will give you a wider understanding of the multidisciplinary nature of care provision. 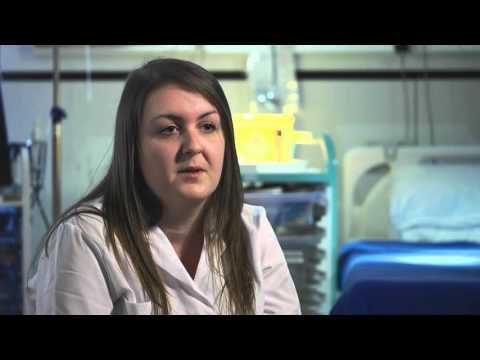 Studying with Leeds Beckett gives you access to diverse placement opportunities including Leeds Teaching Hospitals Trust and Leeds Community Healthcare Trust. These organisations offer work experience placements in a variety of settings including secondary and regional care units, community teams and GP practices. You can also apply for exciting projects such as working with the medical services at Leeds and Download Festivals, Headstart or the final year Community Scheme and focus on areas of personal interest in healthcare during the volunteering strand of the course. All offers are subject to satisfactory health and criminal history checks. GCSE English Language, Mathematics and Science Grade C or above (Grade 4 for those sitting their GCSE from 2017 onwards). Science subjects accepted include Anatomy, Applied Science, Biology, Chemistry, Health & Social Care, Human Biology, Physical Education, Physics, Physiology, Psychology and Science. Key Skills, Functional Skills, BTEC level 2 and the Certificate in Adult Numeracy/Literacy are accepted in place of GCSEs. In a relevant subject, Pass overall with a minimum of 112 UCAS tariff points, to include at least 15 Distinctions and the remainder Merits. You are required to have a care experience in an adult health practice/clinical setting, such as an acute hospital or a nursing home. All applications should be supported by a second reference in addition to that supplied on your UCAS form. Please note references should be accompanied by a covering letter on headed paper or emailed directly by the referee. Research into the adult nursing profession. Examples of how you have worked with vulnerable adults or worked within settings such as hospitals or nursing homes. How you have gained insight into the course e.g. Open days or speaking to nurses. Your personal qualities which you feel are related to nursing, including what motivates you to choose nursing as a career. You must also be able to demonstrate how you meet the NMC Key Competencies through the application process. These competencies determine the basic skills required for nursing in numeracy, communications, physicality, relationships and IT skills. Selection criteria will only be used if you have met the general entry requirements and only if you are successful at this stage will you be invited to a selection day. The selection day will involve an individual interview and a short IT/literacy test and a numeracy test. Performance at the selection day will determine whether you are made an offer. Applicants will be required to bring to a selection day photographic ID (Passport, Driving Licence) and original certificates for all qualifications awarded to date. If you do not possess your original certificates, we recommend making arrangements to obtain copies in preparation should you be invited to a selection day. IELTS 7.0 with no skills below 7.0. In a relevant subject, Pass overall with a minimum of 120 UCAS tariff points, to include at least 15 Distinctions and the remainder Merits. On successful completion of your course, you will be able to apply for registration with the Nursing & Midwifery Council and will be qualified to work in adult nursing roles for a variety of organisations across all sectors. To give you a competitive edge in the job market, you will take part in a variety of employability sessions during your course. You will experience mock job interviews and be encouraged to explore alternative experiences at home and abroad. We regularly review our courses to ensure we are offering you the best educational experience. This course is currently being reviewed for 2019 entry, therefore the information below is correct for students joining us in 2018/19 but there may be changes for students who wish to join us in 2019/20. The full confirmed details of the course as it will be offered for 2019/20 will be published from January 2019. You will gain the expertise needed to become a knowledgeable and skilled practitioner in healthcare, able to act with leadership and care to support people and their families. You will learn the framework of existing professional principles and standards upheld by the Nursing and Midwifery Council. The tabs below detail what and how you will study in each year of your course. The balance of assessments and overall workload is indicative and may be subject to change. Gain the fundamental knowledge required to participate in effective nursing practice. You will study communication, applied biomedical sciences and look at law and ethics in the professional context. You will also apply what you have learned as you embark on your first placement, and develop your reflective practice. 899 hours Independent study  This is the time outside your timetabled hours when you will be expected to continue learning independently. Typically, this will involve reading, research, completing assignments, preparing presentations and exam revision. 660 hours Placements  Some modules will give you the opportunity to undertake a work placement. These hours will be spent working in industry, gaining practical knowledge and professional skills that can be valuable to employers. Develop from a dependent to a more independent learner in order to be able to meet the challenges of academia and personal and professional practice successfully. You will be prepared for practice placements, and we will provide support during them. You will reflect on your developing clinical practice and support this with theory. You will demonstrate your understanding of the concepts of health, wellbeing and recovery and their determinants, and apply different models of nursing to explain roles nurses take in contributing to health in different practice settings. Gain an introduction to the professional, ethical and legal principles that underpin the clinical practice of registered nurses. It aims to develop your understanding of the context in which these principles operate. Examine the core/fundamental communication skills essential for caring and compassionate nursing practice. You will have the opportunity to develop skills in a safe, supportive and supervised environment in order to develop a sound theoretical understanding and an ability to integrate and apply knowledge and skills in practice placements. Study the normal anatomy and physiology of selected systems, progressing to explore altered physiology and function and evidenced based nursing interventions. Deepen your expertise on the modules studied in Year One. You will have the knowledge and skills to meet the essential mental and physical health needs of people of all ages and conditions as well as their own field of practice. 282 hours Teaching and learning  Typically, this will include lectures, seminars, tutorials, supervised studio time or laboratory time and one-to-one meetings with your personal tutor. 773 hours Placements  Some modules will give you the opportunity to undertake a work placement. These hours will be spent working in industry, gaining practical knowledge and professional skills that can be valuable to employers. Build on the concepts you explored previously, as you study the principle of homeostasis in physiological control in health and disease. Build on the concepts you explored in Year 1, as you examine the normal anatomy and physiology of selected systems and progressing to explore altered physiology and function and evidenced based nursing interventions. Continue your development to be an independent learner in order to be able to meet the challenges of academia and personal and professional practice successfully. Build on the learning from Communication For Nursing Practice 1. You will develop a sound theoretical understanding and an ability to integrate and apply knowledge and skills in more complex and challenging situations in a safe, supported and supervised environment. Expand on your knowledge and practice experience related to nurses' work intending to promote health. You will complete your studies in developing nursing in practice skills, such as leadership, professional awareness and non-medical prescribing, before embarking on your final placement of 12 weeks. The module Developing Professional Awareness will support you as you undertake your final placement and apply for your first post. Upon completion of your Year Three modules you will be eligible for Nursing & Midwifery Council registration. 924 hours Independent study  This is the time outside your timetabled hours when you will be expected to continue learning independently. Typically, this will involve reading, research, completing assignments, preparing presentations and exam revision. 741 hours Placements  Some modules will give you the opportunity to undertake a work placement. These hours will be spent working in industry, gaining practical knowledge and professional skills that can be valuable to employers. Build on your understanding of health, wellbeing, recovery, co-production and health promotion. The module will support you to critically consider service models and intervention developments intended to support people to live with or recover from health problems. Explore the fundamental premise of globalisation and evaluate health care needs and provision within a dynamic context, while appraising the influence of leadership, management and innovation in contemporary health care. Enhance your clinical, professional and transferable skills developed in the first two years of the course. You will be supported during placement learning periods and be given a structure to assess the student against the NMC Competencies. You will understand the key elements of the Nursing and Midwifery Council professional curriculum for Non-Medical Prescribing, to link the theory underpinning the use of medications to patient and service user centred care and to become aware of professional standards of proficiency in medicines management responsibilities. You will focus on four themes from the NMC Code: i. Prioritise people. ii. Practice effectively. iii. Preserve safety. iv. Promote professionalism and trust. Course Director for Pre-Registration Nursing Courses including adult nursing, mental health nursing, nursing associates and apprenticeships in nursing. It's really rewarding to see our students develop during their time with us, using the knowledge and skills that they acquire during university and practice to realise their own potential and become compassionate and caring nurses. Adult Health and Mental Health Nursing placements are generally in West Yorkshire predominantly in the Leeds NHS Trusts, but some experiences may be offered in Harrogate or other North and East Yorkshire Trusts and Private Independent and Voluntary Organisations. Placement locations and experiences will vary throughout the course - international students will need to pay for any additional travel and accommodation costs for placements.